It was a rainy here in Austin, TX, so we spent the morning making sugar cookie cut-outs (aka Tea Cakes), an activity Fuzz loves and one she is getting better at. She is using sprinkles more judiciously these days and she’s less of a loose cannon with the cutters – asking for help when the dough sticks to the cutter, rather than just pushing it into a ball or shoving it in her mouth. We had one incident with the black sprinkles, too messy to relive, but other than that, it was fun. Every year it gets a little more so. I’m not loyal to one sugar cookie cut-out recipe, so today we used an old one from Southern Living, recommended by my friend, Val. It’s a great recipe and makes a very easy to work with dough. I did make it a point to chill the dough and I also used 1/2 cup of trans fat free shortening for half of the butter. I also added 1/2 teaspoon salt, as per Val’s suggestion. These are quite good! Val says they’re even better the next day. That’s always nice. Update: In my opinion this recipe works best for big, round cookies and are not ideal for cut-outs (though it can be done). The dough is easy to roll, but it’s on the sweet side and spreads a bit. If you use shaped cutters, make sure to use a very generous amount of flour for rolling. If you are looking for a recipe that doesn’t spread as much and holds its shape when cut, I recommend Cookie Cut-Outs with No-Fail Icing. Old-Fashioned Tea Cakes or Sugar Cookie Cut-Outs. 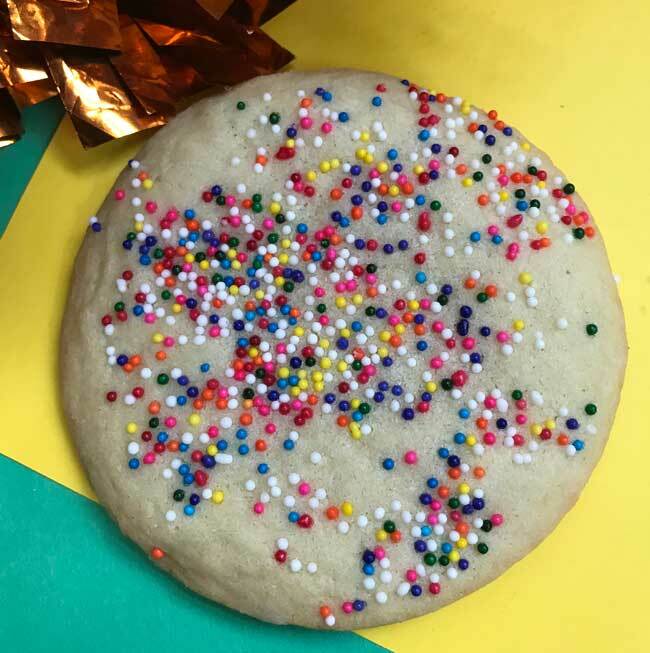 This recipe is versatile in that you can make big round sugar cookies (perfect with just a sprinkling of sugar) or cut-out cookies that take well to frosting. For cut-outs, you'll need to roll the dough in a generous amount of flour. With an electric mixer, beat butter until creamy; gradually add sugar, beating well. Add eggs, one at a time, beating well after each addition. Add buttermilk, and beat well. Combine flour, soda and salt; gradually stir into creamed mixture. Stir in vanilla. Chill dough several hours or overnight. Roll dough to 1/4" thickness on a lightly floured surface; cut into rounds with a 3 1/2" cookie cutter. Place 1 inch apart on lightly greased cookie sheet; sprinkle with sugar. Bake at 400° for 7-8 minutes or until edges are lightly browned. Remove cookies to wire rack and let cool completely. This will give you big, round cookies that spread slightly and are sweet enough to serve just with sugar. For cut-out cookies, divide the dough into three sections so that it is easier to work with. Roll each section out individually (keeping remaining sections refrigerated) on a VERY well floured surface. You can roll anywhere between 1/8 to 1/4 inch thick. Bake time should be about 8 minutes at 400. This is 3 1/2 heavy handed (5 oz/140 grams each) cups. For best results you should weigh it. The yield will vary depending on how big you make the cookies. If you really do use a large cutter (around 3 1/2 inches across) you'll get about 2 dozen cookies. In other news, Fuzz and I won our two year campaign to get Todd to let us buy a big, blow-up lawn ornament. We started with a somewhat classy one, a Tigger in a cauldron. The very best sugar cookie recipe I have found is Nigella Lawson’s in ‘How to be a Domestic Goddess’. I agree about ‘underbaking’ them too – just slightly turning golden brown is the best. I make and frost these every year for Halloween (pumpkins, ghosts etc), and they always disappear in minutes. Marianne, thanks for the tip on the Nigella cookies. I’ll have to give those a try.I think my all-time favorites are still a cut-out recipe called “sawdust cookies”, but the dough is very tricky to work with and not so kid-friendly. I thought the ones I baked for a little less time were best. they had just started to turn brown on the edges. the cookies that were as dark as the one you have posted there weren’t quite as good. One of my co-workers brought in that recipe for a party last year, except she frosted them instead of using sugar sprinkles. They were so good I asked her for the recipe- I’ll need to add the note about additional salt.Very nice Tigger!